Joint operations are military actions conducted by joint forces and those Service forces employed in specified command relationships with each other, which of themselves do not establish joint forces. A joint force is one composed of significant elements, assigned or attached, of two or more Military Departments operating under a single joint force commander (JFC). The primary way the Department of Defense (DOD) employs two or more Services (from at least two Military Departments) in a single operation is through joint operations. The US employs military capabilities in support of national security objectives in a variety of military operations and activities. The purpose of military action may be specified in a mission statement or implied from an order. Operations and activities are characterized as “joint” when they are conducted by a force composed of significant elements, assigned or attached, of two or more Military Departments operating under a single JFC. Distinct military operations and activities may occur simultaneously with or independently of others even within the same operational area (OA). For example, a noncombatant evacuation operation (NEO) may be in the same OA where US forces are conducting COIN operations. Additionally, each may have different root causes and objectives. Joint Warfare is Team Warfare. The Armed Forces of the United States—every military organization at all levels—are a team. The capacity of our Armed Forces to operate as a cohesive joint team is a key advantage in any operational environment (OE). Success depends on well-integrated command headquarters (HQ), supporting organizations, and forces that operate as a team. Integrating Service components’ capabilities under a single JFC maximizes the effectiveness and efficiency of the force. However, a joint operation does not require that all forces participate merely because they are available; the JFC has the authority and responsibility to tailor forces to the mission. Whereas the term joint operation focuses on the integrated actions of the Armed Forces of the United States, the term unified action has a broader connotation. Unified action refers to the synchronization, coordination, and integration of the activities of governmental and nongovernmental entities to achieve unity of effort. Failure to achieve unity of effort can cost lives, create conditions that enhance instability, and jeopardize mission accomplishment. Unified action is based on national strategic direction, which is governed by the Constitution, federal law, and USG policy. 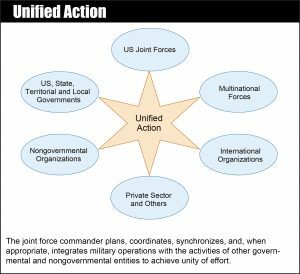 Unified action is a comprehensive approach that focuses on coordination and cooperation of the US military and other interorganizational participants toward common objectives, even if the participants are not necessarily part of the same command or organization. Enabled by the principle of unity of command, military leaders understand the effective mechanisms to achieve military unity of effort. The goal of unified action is to achieve a similar unity of effort between participants. This publication uses the term interorganizational participants to refer collectively to USG departments and agencies (i.e., interagency partners); state, territorial, local, and tribal agencies; foreign military forces and government agencies (i.e., multinational partners); NGOs; and the private sector. The US Department of State (DOS) has a complementary approach, which defines unity of effort as a cooperative concept that refers to coordination and communication among USG organizations toward the same common goals for success. JFCs are challenged to achieve and maintain operational coherence given the requirement to operate in conjunction with interorganizational partners. CCDRs play a pivotal role in unifying joint force actions, since all of the elements and actions that compose unified action normally are present at their level. However, subordinate JFCs also integrate and synchronize their operations directly with the operations of other military forces and the activities of nonmilitary organizations in the operational area to promote unified action. Joint forces must be prepared to plan and execute operations with forces from partner nations (PNs) within the framework of an alliance or coalition under US or other-than-US leadership. US military leaders often are expected to play a central leadership role regardless of the US Armed Forces’ predominance, capability, or capacity. Commanders should expect the military leaders of contributing member nations to emphasize common objectives as well as to expect mutual support and respect. Although individual nations may place greater emphasis on some objectives than on others, the key is to find commonality within the objectives to promote synchronized progress to achieving the objectives. Cultivation and maintenance of personal relationships among counterparts enable success. Language and communication differences, cultural diversity, historical animosities, and the varying capabilities of allies and multinational partners are factors that complicate the integration and synchronization of activities during multinational operations. Likewise, differing national obligations derived from international treaties, agreements, and national legislation complicate multinational operations. See JFODS5 chap. 7 for further discussion of multinational operations from JP 3-16. CCDRs and subordinate JFCs often interact with a variety of other interorganizational participants. This interaction varies according to the nature of participant (capability, capacity, objectives, etc.) and type of operation. JFCs and planners consider the potential contributions of other agencies and determine which can best contribute to achieving specific objectives. Often, other interagency partners, primarily DOS, can facilitate a JFC’s coordination with multinational and HN agencies, NGOs, and the private sector. DOD may support other agencies during operations; however, under US law, US military forces will remain under the DOD command structure. Federal lead agency responsibility may be prescribed by law or regulation, Presidential directive, policy, or agreement among or between agencies. Even then, because of its resources and well-established planning methods, the joint force will likely provide significant support to the lead agency. See JFODS5 chap. 8 for further discussion of interorganizational cooperation from JP 3-08.